I wanted to read this book since I heard about the US show (which has no relation to the French show). When I got an ARC, I was excited to start it and I really enjoyed the first several chapters as well as the intriguing premise. But then I started to slow down on it and it felt like the story meandered for a bit, buying time for its inevitable ending. 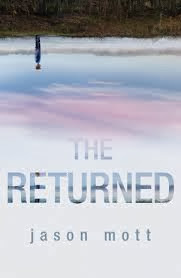 The premise behind this book is that people who died suddenly come back. They come back at the age in which they died and they act like the people who they are...but of course the real question is ARE THEY? Are they actually the people who died or something else? There's no rhyme or reason to the returns they are happening all around and the people are showing up in unlikely places. The story focuses on Harold and Lucille whose only son comes back at the age that he drowned. They both struggle with their feelings about his return which also leads to a struggle over feelings about his death. People keep coming back, though, and the world is getting overpopulated. The government doesn't know what to do about the problem and Mott focuses the story on Arcadia where the returned are kept at a school that eventually extends to taking over the whole town as a holding area. This was really where the story stalled out for me. But I did enjoy the idea and the brief explorations of what it would mean to have another chance with someone who has passed on. It's a really intriguing idea since sometimes you know, you think you'd do anything to be able to see them again. But also because there were SO MANY years since the people had died in this case, your life becomes something else and you yourself are someone else and that person was like...frozen in time. The book was okay not great for me. But I do have high hopes for the show. I think it should be able to pull out and focus on the more intriguing ideas. It's billed as a limited series which worries me a little that it will follow the trajectory of the book, but who knows. I know I still need to watch the French show as well! Thanks to Mira for sending me an ARC!